For other beginners following the vertex tutorial may I suggest adding a link to the file mentioned in the article. however it might also help adding a corresponding pixel editor file so that completely new people to the subject can download the free application, open it in the pixel editor software and see how it is formatted to create their own. I am using Pyxel Edit for this purpose and I have also attached the corresponding .pyxel file for this application (attached to this post). This is a commercial software package but a free (older) version can be obtained free of charge from the official website (I'm not affiliated and this is not a hidden ad ). EDIT: Removed unknown artist's tiles. EDIT: Added my own tile files & added embedded picture. This was brought up before; no-one was sure which licence is applied to the image and not sure who created it or couldn't contact its creator. Therefore, sharing this image might be against the limits allowed by the creator. That's a valid point. I have edited 1st post, removed the files I created by modifying unknown artist's work. Instead added hopeless artist's work (mine). it's ugly but gets the point across, I still think it would be beneficial to give people something they can open and inspect. license is cc0, public domain, free to add if you like. This does go to show that it would be useful to have the ability to distribute the tiles so people can reproduce the example. 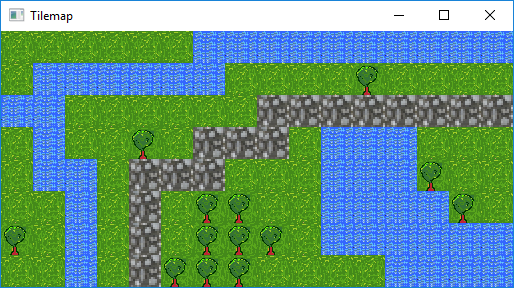 If the license is still not too good, I think that having good looking tileset for tutorials is really important. Ugly tilesets can provide some bad feelings about the library/tutorials. Isn't a simple .png enough for this? Why create dependency on some editor considering png can be edited with nearly every editor? Better looking tile is definitely, well, better. My suggestion about also supplying pyxel edit file is not creating any dependency however. It is merely providing another file for those who wish to manipulate tiles easily with a special software. Those who do not wish so are not forced to use it, or even download the second file. Cool! Would one of you provide a fix for https://github.com/SFML/SFML-Website/issues/46, especially with something with a clean licence? In response to your question, for a fix for SFML website issue #46 (public domain clone of the wiki tileset) please feel free to use the two files in the 1st post. It would do the job till someone supply a better ready-to-use file. A PR would be even more appreciated. Pulled down the older Pull Request, added a new one in the light of Mario's comment.